Sunday August 27th 1893 We got breakfast over and Laura and Jennie went to church and then on over to Woolfs. Will and I went over home and found Father and Mother all alone. In the afternoon we went to Woolfs. I got our suppers after I came home. Laura came just before night. She had been out to supper. We spent the evening at home. Monday August 28th 1893 Will helped me with the washing this morning. I finished that and got the dinner. In the afternoon I scrubbed some, got the clothes in, and made sweet apple reserves. Laura had her supper early and went to the valley with George Stevens. Will is digging our potatoes. 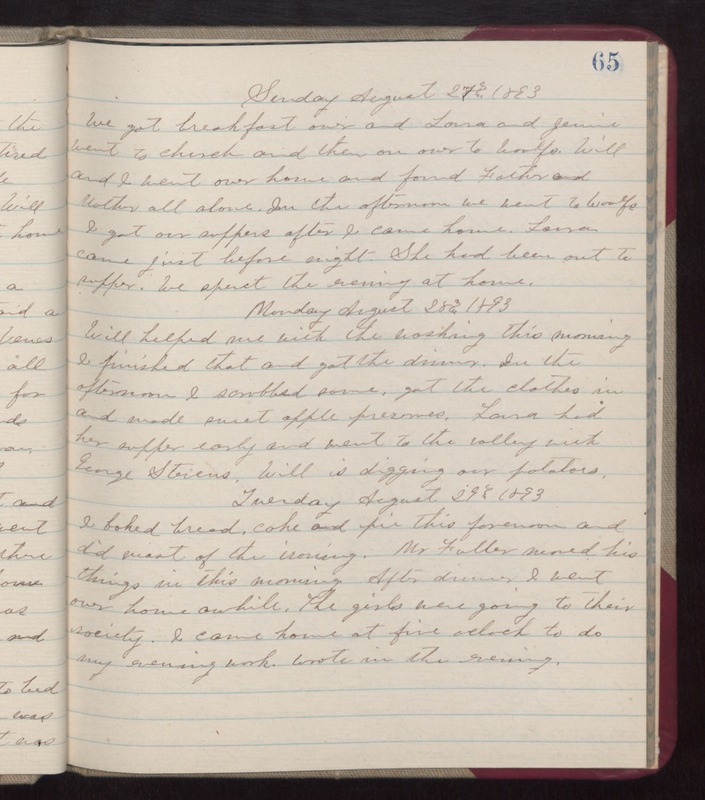 Tuesday August 29th 1893 I baked bread, cake and pie this forenoon and did most of the ironing. Mr Fuller moved his things in this morning. After dinner I went over home awhile. The girls were going to their society. I came home at five oclock to do my evening work. wrote in the evening.